The seasoned micro-dweller challenges himself to downsize yet again. 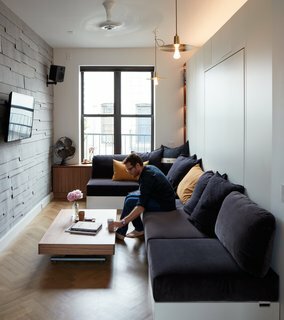 In 2012, entrepreneur Graham Hill moved into a 420-square-foot SoHo studio that would act as his personal residence and a showcase for a movement. "I wanted to start a conversation about how doing more with less could improve our lives from an environmental, financial, and even emotional perspective," he explains. Graham, who is the founder of eco-blog Treehugger.com and other online ventures, turned to the Internet for ideas, partnering with crowdstorming platform Jovoto to launch an international competition to design the space. Out of 297 entries,the winning submission, authored by two Romanian architecture students, promised the functionality of an area more than twice the apartment’s size, thanks to a fluid layout, a custom moving wall, and transformable furniture.